A contract for the first of up to four KC-46A tankers for Japan has been awarded to Boeing by the USAF. 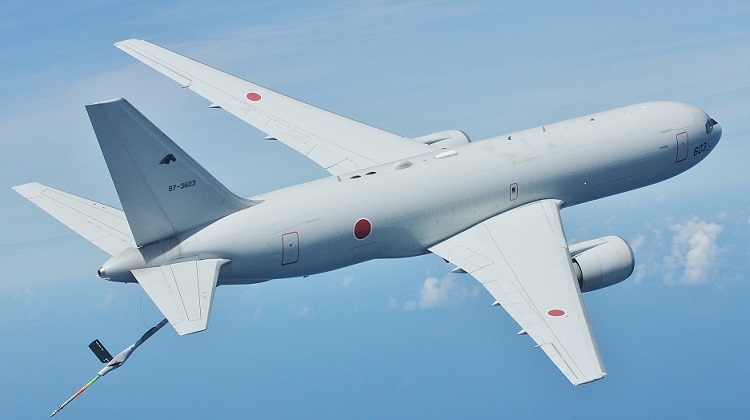 The US$289m (A$370m) contract is a fixed price amount for a single aircraft for the Japanese Air Self Defence Force, the first international sale of the USAF’s new 767-based tanker. The amount includes non-recurring work to establish engineering and logistics support in Japan, and to incorporate Japanese-specific requirements. “We are excited to partner with Boeing as we assist Japan in advancing its aerial refuelling capabilities,” Brig Gen Donna Shipton, program executive officer of tankers for the USAF said in a statement. Despite being developed from a commercial airframe and Boeing’s extensive experience in building tankers for the USAF and other countries, the KC-46A program has been dogged with development delays which has seen it miss several key developmental and delivery milestones. This has given rival Airbus a lead in the international market with its A330-200 MRTT which has logged more than 50 sales to eight countries to date, with several options pending. The USAF has a program of record for 179 KC-46As under its KC-X program, and is currently contracted for 17 aircraft. Japan already operates four KC-767s that, despite their similar 767-heritage, have different mission and air refuelling systems. One would think that Boeing would have selected something bigger than the 767 to base the KC-46 off. The KC-30 can offload 1/3 more fuel than the -46 which doesn’t really add up to value for money. Maybe Boeing could have developed the 777F into a tanker. It may be considerably more costly to do, but you end up with a tanker that could well and truly outperform the KC-30 in fuel or cargo carried and time on station. The most amusing thing about this is the A330 tanker we fly was the initial winner of the Tanker competition in the USA but typical of America, who are happy to force the sale of their products around the world, adopted a “Not made here” approach that has seen the selected Boeing program well behind schedule for an airframe that is smaller, has less cargo capacity, less range and has been plagued by problems as the Airbus variant has been successfully flown around the glode in many airforces. Its also amusing to see it and the voyager being the “Go to” tanker for US forces in the middle east. I truly believe that our tankers and a number of foreign ones will be entering upgrades before the much vaunted KC45 enters service. Ahh American industry you reap what you sow with your arrogance. The RAAF is working with Airbus to develop autonomous boom tanking which has been successfully tested. It will have IOC this year or next with the RAAF along with the RAAF/Government receiving royalties for the technology once other nations buy it as an upgrade to their KC-30 tankers. The USAF KC-Y will hopefully be a KC-30 but time is running out for them to buy the COE option. I also would hope the RAAF would go ahead and buy the further 2-5 tankers which they where talking about and is in the white paper as well. The KC46 Pegasus is a single mission asset – an aerial tanker. In a world of squeezing defense budgets, that seems somewhat myopic. A further 2 – 5 KC-30A? Thought it was a further 2, for a total of 9. Source? Reportedly, the reason why the Boeing 767 was chosen over that of the A330 MRTT was the size (as well as US politics and our defense industry). The USAF has a large budget and the numbers to use many aircraft compared smaller air force’s like the RAAF, RAF, etc. Its more of a 1 mission type aircraft. That mission is to aerial refuel during intratheater operations (such as over Iraq and Afghanistan instead of USA to Australia). The KC-10 (which are larger) are more for strategic refueling. The more tankers the better! Yes it will be expensive, but the tankers are the first to be taken out. Now that would be really expensive! The 747-8F would make a great tanker. One of the US Air Force’s justification of going with the KC-46 over the A330 based KC-45 was that the smaller jet was supposedly cheaper and took up less ramp space in theatre, and would give them more hoses/booms in the air. Ramp space! Yeah, that sounds like the excuse you tell your mates after your wife said you can’t go.